i perused my list of nrw hopefuls and couldn’t really decide what sounded best this week. 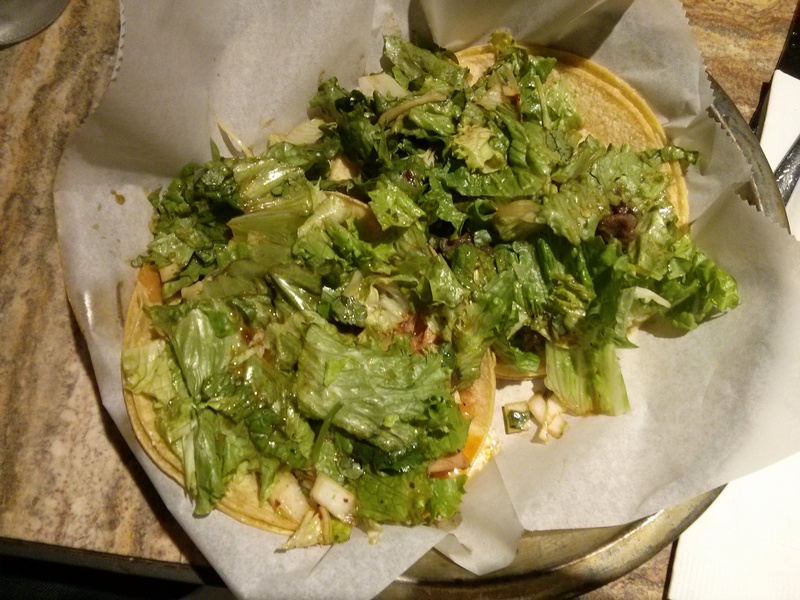 then, in a striking moment of clarity, i remembered good ‘ole hankook taqueria over on the west side. i have literally only been there once, and it was about four years ago with my old small group, but i remember it being one heck of a place. i thought it might be a contender, but kyle reminded me about the very limited parking. eh, that’s right….but! to keep in the spirit of that line of asian fusion cuisine, we decided on the midtown location of takorea. takorea is the creation from hankook taqueria chef tomas lee, hence why i didn’t mind coming here in place of hankook. their idea is to make korean flavors available in a fun and energetic atmosphere by presenting it through traditional mexican dishes like tacos and burritos. don’t be fooled, though, because the fresh ingredients and components are all asian. you’ll be easily introduced to your new favorite street snacks, wondering how you lived all those years without these flavors! sound exciting? then read on to see how much we all enjoyed it! after rounding the block a couple of times (it isn’t the easiest place to spot from juniper, but if you’re at the pay lot on the corner of peachtree and 6th, you’ll see the big sign, i promise), kyle and i arrived at 7:30 on the dot and were promptly shown to our reserved table. we were kind of in an alcove all to ourselves, which was nice since we were away from the bustle of the wednesday night crowd. i’ll say, though, that in the winter time, our spot was a little chilly since we were surrounded on all sides by old garage doors. i bet that in the summer it’s awesome and much more enjoyable. but, hey, you work with what you got, and that’s what coats are for in the colder months. 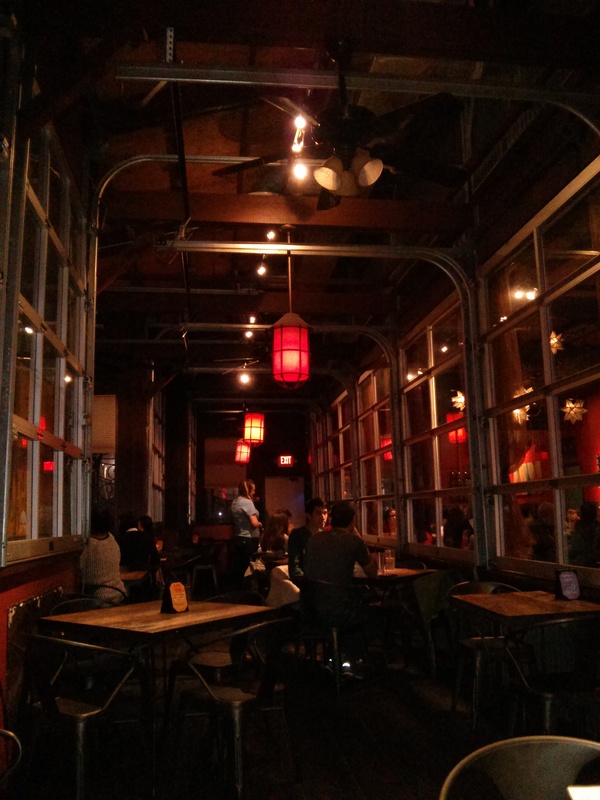 takorea isn’t huge or fussy; it’s roomy and subtly eclectic. you shouldn’t feel too crowded as you elbow up with your friends, a nice atmosphere when you’re here for some community and camaraderie. kyle pointed out that there was only one tv in the whole place, a great thing to minimize distractions. eating is a social event, and being social means interacting with your amigos, so put those devices away and enjoy their company! oh, and get to eating. i mean, that is why we’re here, right? kyle is the only one who had been to takorea previously, so he was quick to make suggestions. he recommended we steer clear of the burritos, for even though he’d never had one himself, he’d seen people get them in the past with disappointment. okay, so no burritos! as we perused the rest of the menu, averting our eyes from the burrito section, i knew i needed something a little stronger than water to sip on; it’d already been a long week, and it was only wednesday! they’ve got a great collection of cervezas and korean beers, so for me it was an easy choice in the modelo negra. modelo has quickly become one of my preferred beers, so i always like to order it when i see it. nathan also helped himself to an adult beverage that evening, going for the hite ice pointe. our food came out in waves as everything was ready, and everything looked so delicious, so much so that i had to alarm the table to get pictures before everything was devoured. we were a hungry bunch that night! we’ll start off with the starters, a very good place to start. a very good place to start? that rings a bell, a bell from the sound of music. you agree? “let’s start at the very beginning, a very good place to start. when you read you begin with a b c, when you sing you begin with do re mi, (echo) do re mi.” ah, thank you for letting me indulge my sound of music obsession! anyway, i digress. let’s get into the food and see what we thought. the minute i read aloud “sesame fries” from the menu, kyle said, “oh my gosh, they are the bomb. we have to get some so you can try them.” well, excellent! let’s order them then! and order them is what we did. these fries are crispy and piping hot and served up with a ramekin of house-made chipotle ketchup. it’s a generous serving of fries, so if you have a smaller stomach like me, this dish is one you could easily share with other folks. when i asked alison what she thought, she simply said “yum, yum, yum, yum, yum.” i actually stopped to count how many times she said “yum.” it was five times, a pretty good review if you ask me. and as for my brother, he declared they were “off the chain, as always.” i also liked them plenty, thankful that kyle let me snag a couple off his plate before they were gone. next up were the tempura sweet potatoes with sweet chili aioli. i had enjoyed something similar at a sushi restaurant in boston with vinh last month, and considering how much i loved those, i knew without question i’d be getting them here, too. the plate was placed in front of me, and i think the drooling was nearly instantaneous. i snatched a piece up right away, knowing that i couldn’t let these bad boys get cold. 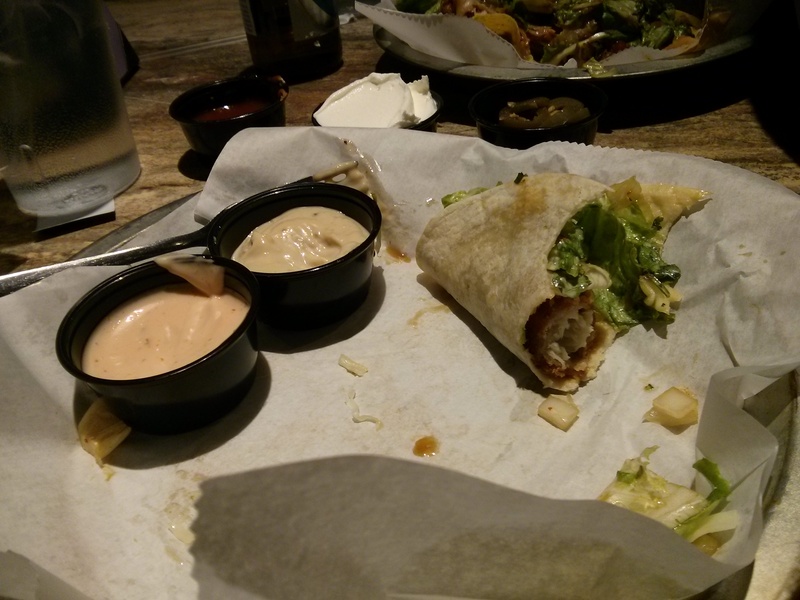 the aioli was a thick and sweet dipping sauce that i promptly coated all over my slice. okay, coated might be an understatement. i practically slathered the slice in that sauce, and it was not something i regretted. the sweet potato is sliced rather thinly so that it isn’t too heavy. the breading is generous but light and, to ruin the fun for you, made this dish my favorite of the night. there, i said it! 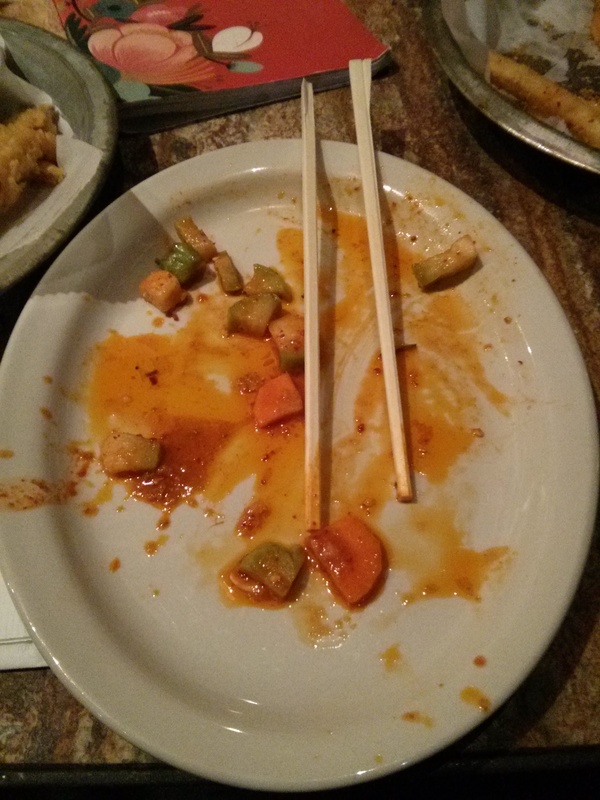 i loved the tempura sweet potatoes! it’s one of those dishes that i could readily and “accidentally” consume all on my own. had there not been so much other food to try, i suspect that is exactly what would have happened. tempura sweet potatoes with sweet chili aioli. vinh and i were both interested in the pork dumplings, so we ordered some up, fried, of course, since we’re in the south. i typically get my dumplings steamed, but the fried version was a good way to mix it up that night. these guys look little, but there is a lot of filling that is a bit deceiving at first glance. the flavors are rich and hit you right as you take a bite, all good things i assure you. i’m not sure i would go out of my way to order them again, but the dumplings are certainly a solid choice. they have something here at takorea called “sticky chicky” in the starters section, and without reading much more than “crispy” and “apricot,” i knew it would be worth the try. i was a little thrown when it arrived at the table; i think i was expecting the chicken to be on a stick, or a skewer, kind of a like a kabob, but i guess with a name like “sticky chicky,” i’m not too far off on my expectation. anyway, the presentation was bright and fun with all those sesame seeds and the purple onion against the orange chicken and colorful lettuce. ah, a dish for all the senses! as vinh and i picked and ate our way through the plate, we decided that it tasted a lot like orange chicken but better. it is sweet without being too apricot-y. the onions were nice and mild, and kyle really like the fresh jalapeno slices in there. considering how much other food we’d already had and would eat, i was able to take some of it home for leftovers. i’m thinking it will be delicious on top of some brown rice. oh, you think so, too? i knew i liked you! now that we’ve had all the fun with the starters, let’s get into the meat of the meal with the entrees. as i mentioned before, everyone was pretty hungry, so soon enough the tables were covered in plates. i present the entrees to you in no particular order whatsoever. 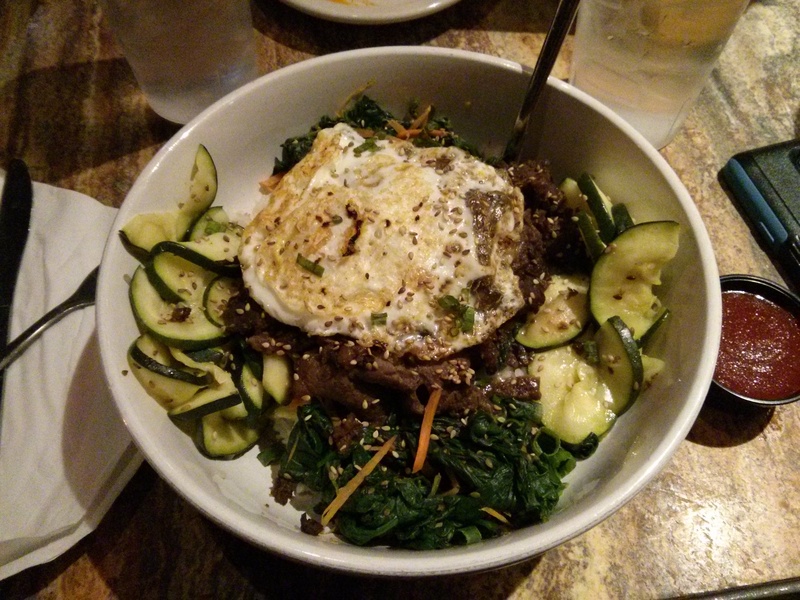 across the table, greg went with the beef bibim with spinach and zucchini. he’s a tall fella, so even though kyle had told him it would be a big ‘ole bowl of food, he was ready for the challenge. i will say i was the tiniest bit jealous when he was served. that bowl looked hearty and delicious and everything you might want on a cold winter’s night. i didn’t get a bite myself, but only two bites in, greg said he would eat here again. the beef was tender and the rice was great! however, the vegetables were a bit overwhelming. there was so much food in that bowl that he got the added bonus of leftovers for lunch the next day. not a bad way to spend your food allowance! beef bibim with spinach & zucchini. a few folks at the table had the kfc tako with chipotle aioli, jack cheese, and tako salad. to quote kyle, it was a “solid tako with an on-point aioli.” and alison, who also had it, thought it was “great chicken with great flavors, very filling.” vinh also had it and ate every last morsel. based on their reviews, it might be one i get the next time i come here. also pictured with the kfc tako below is the pork tako, marinated korean bbq-style with tako salad and spicy korean red sauce. kyle felt it was “packed full of pork and that the] sauce had a good balance of flavor and heat.” i agree that it looked filling; he even said he was still full the next day from it! to my left, vinh could not get enough of the calamari tako. that fried calamari with sweet chili sauce and tako salad kept him pretty quiet throughout his meal. he highly recommended i get it next time, and considering i love calamari with something sweet like a nice sweet chili sauce, there’s a good chance that will definitely happen. jamie was on the tako train that night, too, going with the chicken tako and beef tako. she liked the tako salad that topped each of them, glad that it was actually lettuce in the salad and not just shredded lettuce. she did withhold the spicy sauce, for she’s a bit of a spice wimp like alison and me, but the takos were still flavorful. the beef was sliced nice and thin, a good thing for an already stuffed tortilla. 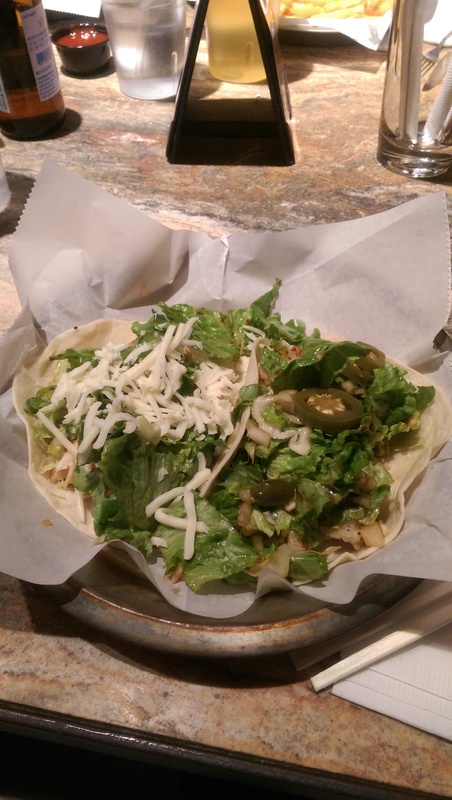 chicken tako & beef tako – so much tako salad! 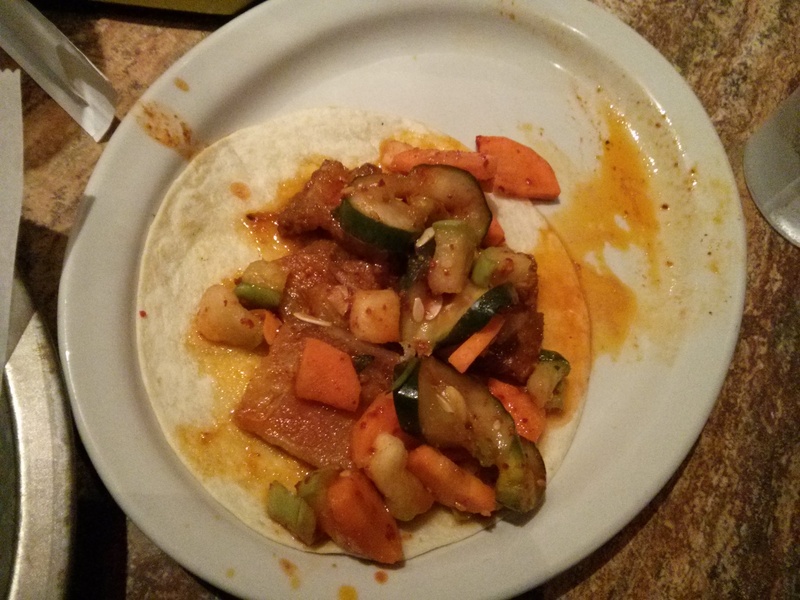 belly tako with pork belly, cucumber, chayote, & carrots. well, let me tell you this much, i put on my brave face, picked up that tako like i didn’t have a fear in the world, and mangled my first bite. the flavors were sweet and spicy all at once, and when i got that first chunk of pork belly, i knew i was done. this tako has crunchy elements and chewy elements and everything good going for it. it was a bit of a flavor journey, and although i’m quite unsure of what all those flavors were, and even though i still don’t know what all that orange sauce was on there, i definitely wouldn’t mind having it again. alison rounded out the tako sampling of the night with the fish tako. she got the fried version with tilapia and tako salad, hoisin tartar sauce on the side. “the flavors were there,” she said, “but the moderately petrified fish stick left me wanting more.” ladies and gentlemen, that is a quote straight for this diner. what a shame that such good ingredients were wasted on a disappointing piece of fish. we guessed that if she’d gotten the tilapia pan-seared instead of fried that it would have been a home run. next time, takorea, next time. fish tako with fried tilapia, hoisin tartar sauce, & tako salad. 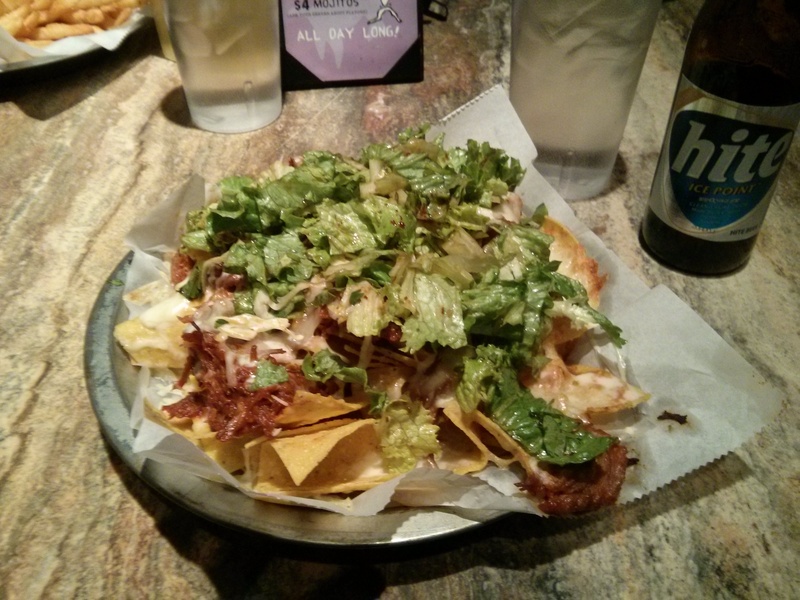 last but certainly not least, we bring you the gogi pork nachos, ordered by our very own nathan. very quickly, i am going to brag on nathan, for he is the only one in the group with perfect nrw attendance. not even i have been to them all! for that, he receives a round of applause and a pat on the back. good work, buddy! now, back to the nachos. this heaping mound of food arrived in front of him, and i found i was peering between the water glasses and over the beer bottles to get a closer looking. those chips were topped with korean bbq-style pork, jack cheese, and tako salad. the kitchen kindly put the jalapenos, sour cream, and spicy korean red sauce on the side for him. once he finally got to eating it, nathan said they were “quite delicious,” also giving a thumbs up to the presentation. he’s especially glad that the red sauce came on the side because although it was flavorful, it might have been a touch overpowering had it been smothered all over the nachos. gogi pork nachos with jack cheese, jalapenos, tako salad, sour cream, & spicy korean red sauce. so, just when i thought the evening couldn’t get any more enjoyable, our waitress katie came over to tell us about the daily special for flippin’ wednesday. at the end of your meal on a wednesday, you can flip a coin with your waiter to get half off your meal or half off bottles of wine. well, with nothing to lose, we decided this was a game we needed to play. the group nominated me to make the call, and with everything to gain, i called “heads” as the quarter flipped into the air, missed katie’s hand, and spun like a top on the floor. we all waited anxiously as she grabbed it and then rejoiced when she exclaimed it was heads. what a great way to end the meal! excellent food, wonderful service, and half off. what more could a girl want? we bumbled down the stairs after dinner, sleepy and satisfied, and although the whipping winter wind soon had us rushing to our cars, i think it’s safe to say that everyone was ready for some serious lounging. i needed my flannel pajamas and a blanket asap so that i could curl up and rest in the satiated stupor that followed. takorea is a restaurant i would gladly recommend to a friend and would happily return to on my own accord. there are so many different things on the menu that it would be a new adventure each visit. 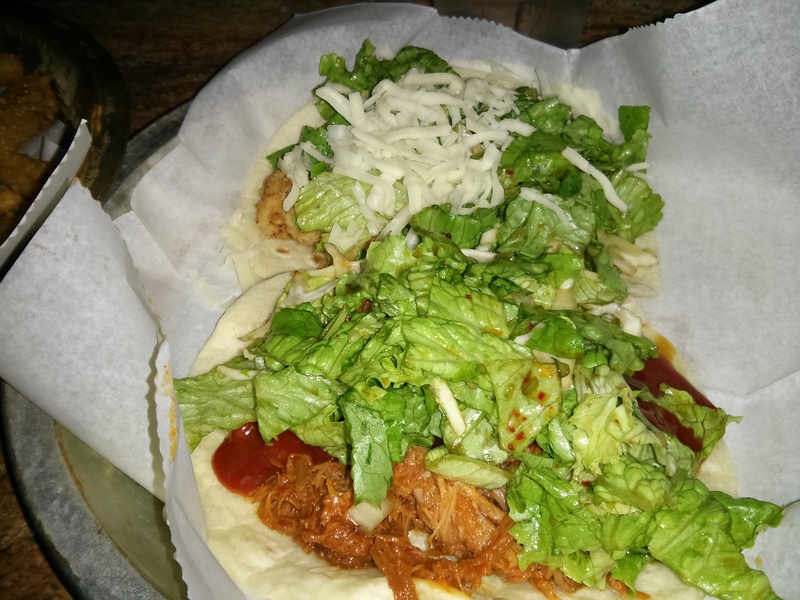 if you like mexican but want a little twist, check out takorea for some great service and even better asian fusion you are sure to remember.